The first couple of months in 2017 have been a busy time for me with my “real” job, and I had not had the chance to make any extended wine trips as I’d often done in the past few years. But I did find myself with a free Saturday in early March and decided to make a short trip to the tasting room of a small producer whose wines have impressed me at several tastings. I drove out to the San Mateo County coast and down Highway 1 through the town of Half Moon Bay, continuing to the even smaller town of Pescadero. The weather was cool but mostly sunny, and an approaching storm held off long enough for me to avoid the rain during my trip. I managed to find a parking spot without much trouble along Pescadero’s main street – which can be very busy on many weekends – and walked the short distance to the tasting room of Sante Arcangeli Family Wines. Sante Arcangeli 2014 Chardonnay, Split Rail Vineyard, Santa Cruz Mountains. Aromas of citrus, spice, and a touch of sweet oak. Medium-bodied with a moderately creamy texture combined with lively acidity and a long, clean finish, nice. Sante Arcangeli 2016 Rosé of Pinot Noir, Santa Cruz Mountains. Light salmon/pink color, with subtle fresh strawberry fruit and a touch of Pinot funk on the nose, plus a hint of stony minerals. Medium-light weight with a bright, crisp finish. Sante Arcangeli 2014 Pinot Noir, Split Rail Vineyard, Santa Cruz Mountains. Medium-light ruby color, displaying pretty floral aromatics along with red fruit, spice, tea leaf, and well-integrated oak. Medium-light bodied with a bright, elegant texture and fine tannins, delicious now and has good potential for cellaring – very impressive. Sante Arcangeli 2014 Pinot Noir, “Family Reserve, Selezione Suzie,” Mardikian Vineyard, Sonoma Coast. Featuring a darker fruit profile of black cherry and plum, this also had bigger spice and vanilla/oak components, with touches of earth and dried herbs. A bit richer in texture with more grip on the finish, this should benefit from some time in the cellar. Sante Arcangeli 2014 Zinfandel, “Old Vine,” Santa Clara Valley. Lots of spice, upfront ripe berry fruit, and vanilla/oak on the nose. Moderately rich yet lively mouthfeel, this had firmer tannins on the finish and will should be worth holding for another year or two in bottle. Sante Arcangeli 2015 Pinot Noir, “Family Reserve, Selezione Suzie,” Toulouse Vineyard, Anderson Valley. This displayed bright red fruit, earthy forest floor/woodsy aromas, plus notes of spice and tea leaf. Medium-bodied with a lively texture and finish – quite nice already and should only get better with cellaring. Sante Arcangeli 2014 Syrah, Split Rail Vineyard, Santa Cruz Mountains. Dark berry fruit, spice, and a touch of wet stones on the nose, along with herbal undertones. Medium weight with good structure, finishing with moderate tannins – a promising young Syrah that should blossom with more time in bottle. 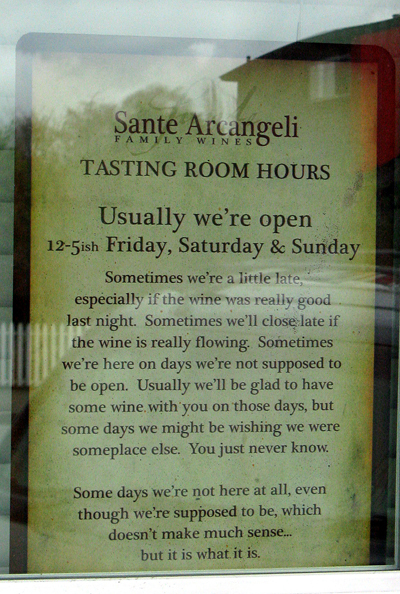 I had contacted Sante Arcangeli owner/winemaker John Benedetti about visiting the winery tasting room – generally either John or his assistant winemaker Drew Carlson are at the tasting room when it’s open from Friday through Sunday. 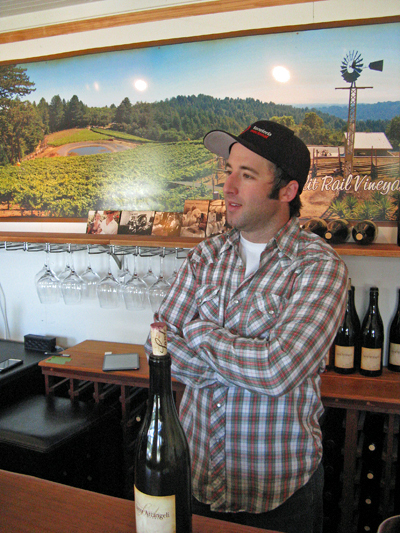 I’d met John and tasted his wines at several of the Santa Cruz Mountains Pinot Paradise events in recent years. Although he was not able to be there the day I stopped by the tasting room, he told me that I’d be in good hands with Drew. I arrived in front of the tasting room just before Drew opened up the door for the afternoon, and he welcomed me in. It’s a fairly small space, with a wood tasting bar at the back and a couple of tables with chairs alongside the windows facing the street. I stepped up to the bar and Drew told me a little about the tasting room and winery. The winery is named for John’s great-grandfather, Sante Arcangeli, who settled in Pescadero in the 1920s and opened a store there. The store is still there today and still owned by the family – Arcangeli Grocery Company (also known locally as Norm’s Market after John’s father) is now run by John’s brothers Mike and Don. John has noted that in the 1970s, Norm began cellaring some highly-regarded French and California wines in a wine cellar under the store, and as a result John was introduced to fine wine at an early age. John did not start making wine right off the bat – he actually began by brewing beer – but by his mid-30s he turned to winemaking. Vintners James MacPhail, Ryan Beauregard, and the Brassfield family (of Heart O’ The Mountain Winery) befriended and mentored John along the way. Today, he describes his winemaking venture as “a hobby gone haywire” – a view that I’m sure is shared by quite a few vintners! John made a little wine in 2008 and 2009, then launched the Sante Arcangeli label with his first commercial vintage in 2010. The first vintages were made at the Beauregard Vineyards facility in the small community of Bonny Doon, and they’re now made at their own winery in Aromas near the southern edge of the Santa Cruz Mountains. Total annual production is around 1,500 cases. John felt that his family’s heritage in Pescadero made it a fitting location for the winery tasting room, which has been open there for about 3½ years. Drew has been working with John for about a year, after previous stints at Beauregard and Mount Eden. 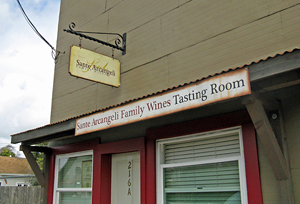 The main focus of Sante Arcangeli is Chardonnay and Pinot Noir, mostly from vineyards in the Santa Cruz Mountains. I asked John via email what it was that drew him to making wine from this region. He told me that it was largely due to that area being his home as well as where he’d found people such as Ryan Beauregard who were helpful to him when he was getting started in winemaking. Early on, he’d considered focusing on the Sonoma Coast – he’s been a longtime fan of James MacPhail’s wines – but circumstances led him to Split Rail Vineyard in the Santa Cruz Mountains during his first commercial vintage and he’s never looked back. Several sites in the Santa Cruz Mountains have been mainstays of the wine program so far – Bald Mountain Vineyard in the Ben Lomond region (Chardonnay), Lester Family Vineyards in Corralitos (Pinot Noir), and Split Rail Vineyard, at a higher-elevation site in the Corralitos area (Chardonnay, Pinot Noir, Syrah). Jim Beauregard heads up the farming at Bald Mountain, while well-known vineyard manager Prudy Foxx oversees the farming at Lester. John works with vineyard manager Matt Partridge and with the Split Rail owners on the farming there. John has worked with other noted vineyards as well, such as Hicks and Saveria, and he’s excited about a new project – Hand in Hand Vineyard in the Pleasant Valley part of Corralitos – that’s been grafted and interplanted with heritage selections of Pinot Noir. Most of these sites are fairly small, and feature heritage selections of Pinot (such as Calera, Swan, Martini, and Mount Eden) rather than the more commonly-seen Dijon clones. Split Rail is of particular interest as John considers it to be Sante Arcangeli’s signature vineyard. It’s located along a ridgetop at 1,700-foot elevation overlooking Monterey Bay, over 1,000 feet above Hicks and Lester Family vineyards. The soil is mostly sandstone and clay, with limestone farther below grade. The Split Rail site was first planted by David Bruce Winery’s vineyard manager Greg Stokes in 1986, and currently has around 2 acres each of Chardonnay and Pinot Noir, with a little over ½ acre of Syrah. Most of the vines are dry-farmed. The original 31-year old Pinot plantings at Split Rail Vineyard are David Bruce Selection and Clone 32 (Champagne Clone), with more recently-grafted Pommard Clone vines. While Pommard is well-known in California, Clone 32 is rarely seen outside of sites growing grapes for sparkling wine. The Clone 32 Pinot vines at Split Rail are actually a happy accident – the nursery that supplied the vines mistakenly provided them instead of the Chardonnay vines that had been ordered. David Bruce Selection is an old field selection consisting of Mount Eden, Martini, Wädenswil (2A), and Pommard clones. This is one of California’s most historic heritage selections of Pinot Noir, with origins in the cuttings brought to California by Paul Masson in the 1890s, reputedly from Chambolle-Musigny. In the 1950s, Martin Ray established his Pinot vineyard from these vines at what is now Mount Eden Vineyard, and vines propagated from this selection later spread to Chalone, David Bruce, and Williams Selyem among others. John has described his goal as that of producing wines on the “more delicate, restrained” side of the stylistic spectrum. But he doesn’t believe in formulaic winemaking and likes to let vintage variations show through in his wines, as well as vineyard distinctions. Chardonnay is whole-cluster pressed, and Pinot Noir is mostly destemmed, though John will sometimes use some whole clusters in the fermentation. Reds are fermented in ½-ton and 1-ton bins, with limited hand punchdowns to help keep the wines from being overly extracted. Most wines get bâtonnage for about the first three months in barrel, ranging from weekly to twice a month. John uses a variety of coopers for his barrel program, mostly French oak, with differing percentages of new oak depending on the wine and vintage. Drew got me started on the latest Sante Arcangeli wines with the 2014 Split Rail Vineyard Chardonnay. Barrel-fermented and aged for ten months in 30% new French oak, this was beautifully balanced and featured fine acidity – a good way to begin my tasting. The 2016 Rosé of Pinot Noir was next, sourced from four Santa Cruz Mountains vineyard sites – Dalardi, McConnell, Lester, and Saveria. The Dalardi fruit was direct-press, and the rest was saignée. The wine underwent partial malolactic fermentation and was made entirely in stainless steel. Bottled fairly recently, the aromatics were a bit shy but should open up with a few more months in the bottle. Drew continued with the 2014 Split Rail Vineyard Pinot Noir, the first of four Pinots he poured for me. Made from the vineyard’s heritage selection plus a little Pommard clone, it was fermented with 5% whole clusters and aged for 10 months in 30% new French oak. With beautiful and intense floral aromatics and a silky mouthfeel, this was my favorite Pinot of the day, a real standout. The 2014 Lester Family Vineyard Pinot Noir was next, from 2A and 115 clones and entirely destemmed, with the wine spending 10 months in 40% new French barrels. This wine shared similar bright red fruit with the Split Rail bottling, along with a noticeably earthier character. 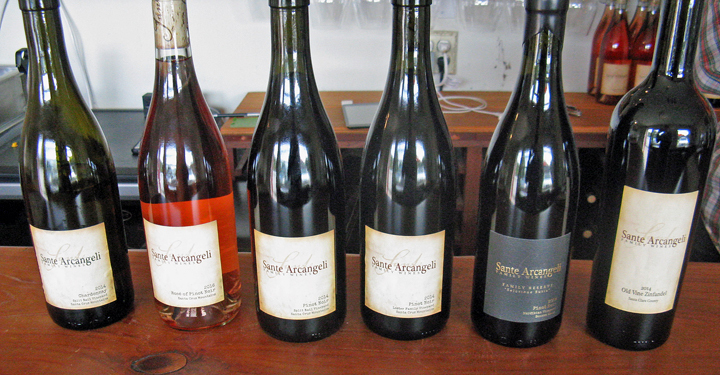 All of the Sante Arcangeli Pinots were very good, and each of them showed off its vineyard distinctions. We took a detour from the Santa Cruz Mountains with the last two wines of the tasting room’s current line-up. The 2014 Mardikian Vineyard Pinot Noir is from a site in the western part of the Sonoma Coast – it actually overlaps the Russian River and Green Valley appellations. The vineyard was planted in 2009 by John’s friend James MacPhail along with noted vineyard manager Jim Pratt, and it’s now the estate vineyard of MacPhail Wines. The wine was made from entirely destemmed 777 and Martini clone fruit, aged 10 months in 30% new French oak, and showed a darker fruit profile and richer texture than the two Santa Cruz Mountains Pinots. Drew next poured me the 2014 Old Vine Zinfandel, sourced from century-old vines near Gilroy in Santa Clara Valley. Big and spicy, this is a youngster that should benefit from more time in the bottle. I’d gone through the six regular tasting room wines, but Drew had a couple of others he wanted me to try – hard to turn that down! First was the 2015 Toulouse Vineyard Pinot Noir, from Anderson Valley. John has noted that it was a wine from this vineyard that flipped the Pinot switch for him in 2002. From 667, 777, 115, and Pommard clones, fermented with 20% whole clusters, and with 11 months in 20% new French oak, this displayed a distinct Anderson Valley profile with its forest floor notes along with red fruits and spice. This is another youthful wine that deserves cellaring to bring out its best. We finished up with a 2014 Split Rail Vineyard Syrah, made with about 10% whole-cluster fermentation and aged in a used American oak barrel. Definitely cool-climate in character, and unlike many young wines aged in American oak barrels, the oak component was already nicely-integrated. In addition to the wines I tasted, Sante Arcangeli also makes a Chardonnay from Bald Mountain Vineyard in the Ben Lomond AVA of the Santa Cruz Mountains and one from Pelio Vineyard above Carmel Valley in Monterey County. There’s also a Santa Cruz Mountains appellation Pinot, sourced from several vineyards – the blend varies from year to year, and the 2014 bottling was from Hicks, Lester, and Split Rail. John has made an unoaked Chardonnay bottling from Split Rail Vineyard in the past and there may be more coming up. Drew told me that the winery’s first Cabernet Sauvignon is in barrel, sourced from Andersen Vineyard near Felton in the Santa Cruz Mountains. After finishing my tasting and saying goodbye to Drew, it was time for lunch. Although the tasting room is just about next door to Duarte’s Tavern – renowned for its artichoke soup – I decided it was more fitting on this day to walk up the street to Arcangeli Grocery Company – famous for its artichoke garlic herb bread – for a sandwich. In case you didn’t get the picture, the Pescadero area is artichoke country! I ordered the chicken pesto sandwich, with sundried tomatoes and melted provolone on herb foccacia. The sandwich was delicious, and although it was enjoyable to sit at a bench in front of the store and watch people passing by, I needed to start heading back home. I did have time to take the scenic route back to Highway 1 by continuing north along Stage Road (the main street of Pescadero) through the coastal hills and the tiny community of San Gregorio and back to the highway. I had a good time tasting with Drew – he was very knowledgeable about the wines and vineyards and a great host. It would have been fun to see John, who’s a real character, but I’m sure I’ll head back to the Sante Arcangeli tasting room to visit with him another day. Overall, these wines continue to impress me. The 2014 Split Rail Pinot Noir was outstanding, one of the best young Santa Cruz Mountains Pinots I’ve tasted in awhile. The 2014 Split Rail Chardonnay and 2015 Toulouse Pinot were also noteworthy, and the 2014 Lester Pinot and 2014 Split Rail Syrah will be worth revisiting in another year or two. I mentioned to Drew that I noticed how well-managed the tannins were in all these wines – overly tannic Pinots have been an issue in the Santa Cruz Mountains, but these were all nicely balanced, with tannins that weren’t aggressive at all. Besides their wines, I should also note that the Sante Arcangeli website is one of the better winery websites I’ve seen – lots of detailed information on both the vineyards and wines. Sante Arcangeli is a newer producer but they’re already making some excellent wines and it will be worth following them in the future. If you find yourself on the San Mateo coast on a weekend, pick up some artichoke bread to take home, and then be sure to stop in at the Sante Arcangeli tasting room!